Since the announcement of the new Turing based RTX graphics card from NVIDIA, many gamers have been saving up to get their hands on the shiny new cards. However, many were disappointed with the lack of official Ray Tracing support for the latest game titles. This is a result of game developers catching up to make sure that their games will work with this new graphics rendering technology. While Ray Tracing has its benefits in more realistically rendered graphics, the raw performance capabilities of the new RTX graphics card when used with traditional games did not quite meet the expectations of gamers. This places the RTX graphics card in an awkward position in the market, as gamers would think harder when making the choice between a GTX 10 series or RTX 20 series graphics card. Last month, the new GeForce RTX 2070 series was finally made available for gamers. Even though it was considered the lowest end RTX 20 series card at the time of writing this article, it was placed in an interesting position between the high end GTX 10 series and RTX 20 series lineup. The new RTX 2070 is also expected to be priced similarly to the GTX 1080. Could the RTX 2070 be a better investment for gamers, as they take smaller risk by spending lesser on a RTX Graphics Card? If the GeForce RTX 2070 graphics card makes perfect sense, should they get just a simple close to vanilla version or a card that is specially designed for wild overclocking speeds? The Gaming OC series of graphics card from Gigabyte is targeted for the masses. By default, the graphics card is set to “Gaming Mode”, which is the base factory overclocked profile. With the AORUS Engine software, users can further increase the performance of their RTX 2070 by setting the card to “Gaming Mode”, which sets the base and boost clock to 1425MHz and 1740MHz accordingly. For our tests, we will leave the graphics card in the “OC Mode” profile. The RTX 2070 Gaming OC 8G is designed exactly like the RTX 2080 Gaming OC 8G. If you are interested in finding out the various technologies which are used by this line-up of graphics card, you can visit the First Look at the Gigabyte GeForce RTX 2080 Gaming OC 8G Graphics Card link. It covers the unique design, cooling system, power and durability features that comes with the Gaming OC graphics card. On the other hand, the XTREME graphics card series from Gigabyte is designed and engineered for consumers who want the best of the best. Gigabyte’s flagship RTX 20 series graphics card are all represented by the XTREME series, which promises unparalleled performance, cooling capabilities and design. One of the most striking features of the RTX 20 series XTREME graphics card is that it is equipped with a unique RGB LED system on both the top, rear and fans of the card. There is a single RGB LED bulb on each fan. When the fan starts to spin up, it creates an illusion of an illuminated ring at the edge of the fans. Such a design can also create a certain RGB lighting effect which was never seen in any other graphics card before. However, we also took note that such an effect can only be achieved when the fans are spinning. This means that if the graphics card is idling, and the fans are not spinning, there will be no lighting effects spotted on these fans. Regardless, the AORUS logo on the top and rear of the card is good enough to set it apart from most of the graphics card in the market. It will look quite cool, if you are planning to build a new system that integrates RGB lighting as one of the factors of its design. The XTREME Series also tackles cooling differently. First off, it is equipped with a metal back plate that helps to passively cool the components that are found on the back of the graphics card. Additionally, the back plate also gives the card some support, increasing the strength of the main PCB which holds on to the rest of the components, heatsinks and fans. The heatsink cools all vital components of the graphics card. This includes not only the GPU, but also the VRAM and MOSFET. There are three portions to the heatsink, and the heat is conducted between them via 3 main heat pipes to the thin fins for dissipation. Moreover, 3 x 100mm fans are equipped on top of the heatsink to effectively bring the heat away from the fan. Even though the RTX 2070 officially only support a maximum of 4 display outputs, Gigabyte provides a total of 7 video output ports for more flexibility between the choice of connection. Users can choose between 3 x HMDI + 1 x DP or 3x DP + 1 x HDMI for their monitors without the need for any additional adapters. For Gigabyte’s graphics cards, 2 main software is provided to control the card. They are the AORUS Engine and RGB Fusion Software. The same software is used for the whole RTX 20 series graphics cards. In this case, we simply had to swap the graphics card out, and the software will be able to register the new graphics card accordingly. For the RTX 2070 Gaming OC graphics card, different configuration profiles are available out of the box. Users can simply select their preferred graphics profile, and the graphics card will automatically be set to the respective core clock for optimal required performance. For out tests, we left the graphics card in the OC Mode. Moreover, the AUROS Engine software also allows for the on the fly tracking of the various vitals of the graphics card, such as the GPU clock speed, voltage, usage, temperatures and fan speed. The AUTO SCAN feature was found to be one of the most interesting feature on the AORUS Engine software. After clicking on AUTO SCAN, the software will automatically seek out for the overclocking profile and capabilities of the graphics card by looking at the various voltages the card can be used to sustain its clock. However, the result of the scan is somewhat useless, and there are no way that you can directly apply the scanned profile to the graphics card. Moreover, the user interface does not tell you the exact voltages and clock speed settings, making it somewhat pointless to do the scan in the first place. The RGB Fusion controls the RGB logo on top of the RTX 2070 Gaming OC graphics card. It can also apply various lighting styles, such as static, pulse, flash, double flash and color cycle. Once the RTX 2070 Gaming OC was replaced with the RTX 2070 AORUS XTREME, the RGB Fusion software automatically reflects the changes. The different areas can be selected and then configured with the colour and effect respectively. Even the speed and brightness can be customized! There was simply no complains for the RGB Fusion software. It was simple and straightforward to use, and functions just as expected. We are going to test both of the models of the RTX 2070 with some synthetic graphics and game benchmarks. We will also test the cards in both 1080p and 4K resolutions for our game benchmarks. The RTX 2070 Gaming OC 8G will be configured in OC Mode, while the RTX 2070 XTREME 8G will be minimally overclocked to increase its base clock to match the Gaming Mode’s base clock. Interestingly, even though the RTX 2070 AORUS XTREME 8G had a higher boost clock at 1815MHz, its base clock remains at stock speeds of 1410MHz. On the other hand, the Gaming OC in OC Mode had a base clock of 1425MHz. This actually made a difference in some of our test, where the Gaming OC always had higher scores than the AORUS XTREME. This is the reason why we were required to increase the base clock of the AORUS XTREME to really see the difference that the much higher boost clock can bring about to the card. While that happened, the boost clock also increased from its default 1815MHz to 1830MHz. We had 3DMark FireStrike and 3DMark TimeSpy to test the DirectX 11 and DirectX 12 performance on both graphics card. Based on the results, we can see that the performance difference between the Gaming OC and AORUS XTREME is really minimal. It seems like an increase in Boost Clock does not really affect the overall performance of the graphics card in this test. When we had both graphics card tested with games, we also saw small increase in performance on the AORUS XTREME when compared to the Gaming OC. In fact, due to usual variations during benchmark runs, there were instances when the Gaming OC performed better than the AORUS XTREME, such as on 1080p results of Final Fantasy XV and 4K results of Far Cry 5. Nonetheless, it is apparent that the AORUS XTREME will perform better than the Gaming OC most of the times, due to its higher boost speed but the increase in performance is not significant. The Gigabyte RTX 2070 AORUS XTREME really shines when it comes to overclocking. It could be highly possible that the GPUs on these cards are cherry picked, and are binned to make sure that they will overclock well. 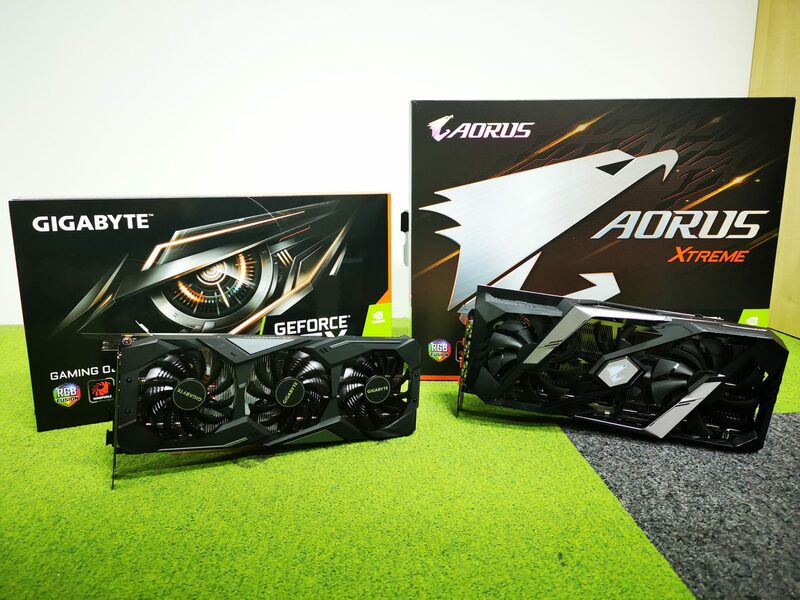 The overclocking of the graphics card was done directly on Gigabyte’s AORUS Engine software, which allowed the configuration of core clocks and voltages. With the AORUS Engine software, we only had the capabilities to increase the GPU Core Clock. When this value is increased, based on the reporting on GPU-Z, base the base clock and boost clock will both offset with the increased value. This brings about an interesting overclocking profile between the Gaming OC and AORUS XTREME, as the AORUS XTREME would likely to reach a high clock as its base clock has not been set to a high level by default. With the software, managed to increase the clock speeds of the Gaming OC to a base clock of 1505MHz and a Boost Clock of 1820MHz. For the AORUS XTREME, we were able to bring the base clock up to 1485MHz and the Boost clock to 1890MHz. We then used these profiles to have another run at Final Fantasy XV Benchmark, to see what kind of scores we achieved. As expected, both graphics card did experience an increase in performance when the clocks were pushed up. It’s also interesting to take note that even though the base clock the Gaming OC was higher than that of the AORUS XTREME, the AORUS XTREME still faired better in overall when overclocked. Also, we also took note that the Gaming OC actually had the capabilities to perform even better than the baseline AORUS XTREME when overclocked. It suggests an interesting proposition that the Gaming OC is actually more bang for the buck, as the AORUS XTREME will cost higher. We had a great experience with both the Gigabyte RTX 2070 Gaming OC and Gigabyte RTX 2070 AORUS XTREME Graphics card. They were both able to perform very well when compared to other graphics card in the market (as shown in our FireStrike and TimeSpy charts). However, when there is a requirement to run games at high quality settings in 4K, it seems that the RTX 2070 was still not there yet. For most of the latest games, the frame rates fell short of the expected 60FPS threshold for a smooth gameplay. The cards totally had no issues on 1080P resolution. We now understand that the capabilities of the RTX 2070. Which of these two models should you choose? If you are looking for a top of the line graphics card from Gigabyte that is able to overclock well, or a card with unique RGB lighting features, the RTX 2070 AORUS XTREME is the right choice forward. That is, if you think that the S$100 premium on the AORUS XTREME is worth it. If you are looking for a more sensible option, the RTX 2070 Gaming OC is well positioned to be a graphics card that provides great performance at an affordable price. Moreover, you will even have the opportunities to overclock it to reach the performance of the AORUS XTREME. The Gigabyte RTX 2070 Gaming OC retails at S$980 while the RTX 2070 AORUS XTREME retails at S$1080. They will be available at authorized retailers at Sim Lim Square and online at Lazada.